Announcing the First Round of 2019 Pageant Workshops! Are you dreaming of long summer days spent making puppets, creating songs, dances and spectacle on the River Clyde? We sure are! The River Clyde Pageant will be returning to the Little Victory Microfarms in just a few short months. We have some big, ambitous plans for this summer’s production and we would love your help transforming them into reality! The 2019 Pageant will be returning to the single-site format we began exploring in 2018 with Catch a River by the Tale. 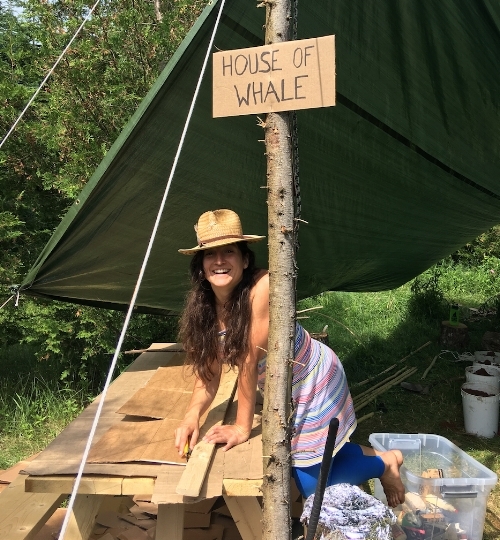 We were so excited by what emerged with last year’s production - it provoked many questions and many more ideas for using the land and the water as both sites and collaborators for theatre making. We’ll be sharing some of these new ideas in the coming weeks, but in the meantime, we are thrilled to announce the first round of free, artist-led workshops, now open for registration! NEW THIS YEAR: High school students (anyone entering grade 10, 11, 12) can get community service credit for participating in the Pageant. Any hours you participate in workshops or rehearsals can be logged to go towards a $750 bursary for post-secondary education. Interested? Ask us for more details. Scenographer and puppeteer Ian McFarlane is offering two new workshops, one workshop in scenic design for the outdoor stage for adults and teens, and a woodcarving and marionette workshop for all ages. 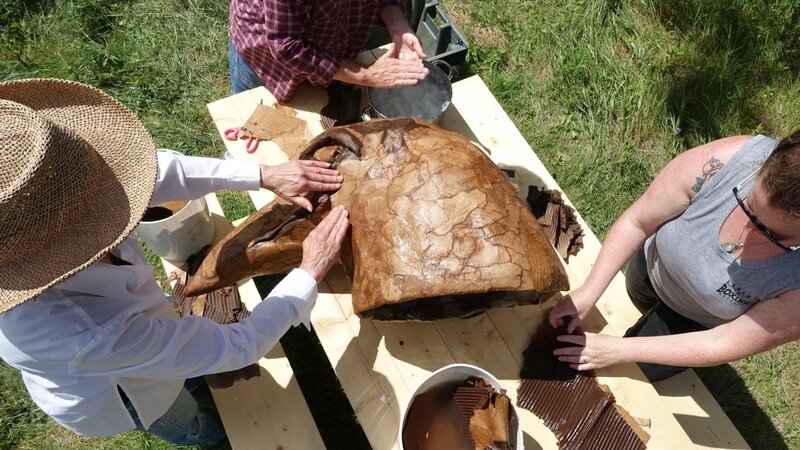 These workshops begin at the end of June and will delve into large design projects and small puppet builds, respectively, using driftwood, found materials and various woodcarving techniques. New Orleans-based artists Kathy Randels and Sean LaRocca are back June 11-23 to lead an expanded music workshop to develop music created in 2018 and lead singers and musicians through songwriting and improvisation processes inspired by the land and water. This workshop is open to musicians and vocalists of all ages and levels, and takes place indoors and outdoors in New Glasgow. Joanna Caplan will be leading a twice-weekly, all-ages movement workshop, June 30-July 18, to create outdoor group choreography on land and water. Laura Astwood will be back in early June to teach stilt-walking basics, partner work and choreography to new stilt-walkers and alumni. Workshop registration is now open. Check out the details & sign up here. We will be announcing more workshops in Kids Drama and Creative Writing later this month, as well as an exciting new collaboration with the Waterways Paddling Festival. We hope you’ll join us for a magical experience this summer! Okay, so it’s been a big weekend of your inbox being filled with one million emails about Black Friday deals and Cyber Monday deals and yadda yadda yadda…and now Tuesday’s here and it’s one more day where you’re being asked to spend money. We get it! Here’s the thing - Giving Tuesday doesn’t come with buyer’s remorse, or the worry of something fitting poorly or being the wrong colour or the wrong gift. 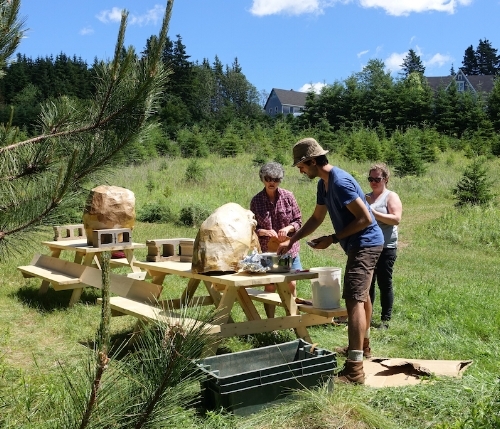 Hopefully, what it does come with, is lots of good feelings and excitement from supporting a community project that brings many people together in the summertime on PEI, to build something big and ambitious and strange and spectacular. Something larger and wilder than our individual imaginations ever thought could be possible. So, if you’ve emerged from this weekend of spending (or not spending!) with some money left in your wallet, consider supporting the 2019 River Clyde Pageant. A donation of any size helps us get next summer’s project off the ground and into the fields and waterways of New Glasgow and the River Clyde. But you don’t have to just take my word for it. Read on to hear from some of the folks who are part of the big Pageant family, about why this project is so important to them, and why it’s worth supporting. “On one night last summer, the performance was delayed because of heavy rain. Ker and Megan decided that if the rain stopped by 7:30pm, we could go ahead with the show. As audience huddled faithfully in their cars, waiting for the rain to stop, the cast sheltered under tarps and trees (and some of the children danced heedlessly in the great wide open). The bulk of us were collected under a large tarp, and we started chanting, continuously, “Rain, rain, go away!” It kept pouring, truly thunderous on the suspended tarp: and then, at what felt like the height of the chant, it stopped. And it stayed stopped. And we all stared at each other, astonished, joyous, at our power. The show went on. Volunteer at this year's Pageant! Tickets for this year's River Clyde Pageant, Catch a River by the Tale, are now sold out! A limited number of tickets have been made available for our dress rehearsal on July 27, which you can buy on the Tickets page. However, we really need volunteers to help out. Volunteers can assist on any night of the show with parking, food prep and serving, and as paddlers for two multi-person canoes on the river. Volunteers will receive a pair of tickets to any night of the performance. A special presentation in June! We are very excited to be producing a special presentation of The Events of the Warren County Fair as Observed by a Young Astronaut, a tabletop toy-theatre play written and performed by Mike Geither and Amy Schwabauer from Cleveland, Ohio. Mike and Amy have been touring this show to homes around the United States since this past fall, and are bringing their toy actors to PEI for three performances on June 23 and 24 in New Glasgow and Charlottetown. The Events of the Warren County Fair as Observed by a Young Astronaut follows the citizens of a small town as they maneuver through an evening of chaos at the local fairgrounds. In the last days of summer, mechanics, teenagers, carnival workers and musicians long for better lives. The show runs 50 minutes, and material is suitable for adults and teens. We're back for 2018! Here's what's up! The River Clyde Pageant is returning to the rolling hills and riverside of New Glasgow this summer, and artistic directors Megan Stewart and Ker Wells are excited to share a reimagined performance and a series of new workshops for the public. In 2018, The River Clyde Pageant will be presented as a single-site performance in the fields of the Little Victory Microfarms, using the natural amphitheatre of the farm and the River Clyde as playing space. Each performance will conclude with a family-style long-table meal in the field, organized by Emily Wells and the team at The Mill restaurant, featuring food from local farmers. This year’s performance dates are July 28-29 and August 3, 4, 5. Public workshops begin in June and continue through July. These artist-led workshops are free of charge and teach participants skills such as puppetry, stilt-walking, music and more. Workshop participants can then join the Pageant as performers, puppeteers, and musicians, or take on other production roles. BC-based puppeteer Ian McFarlane is back to lead the creation of several large-scale puppets that will move on water and land. Puppet building sessions will occur twice a week in July, with Wednesday evenings reserved for small puppet projects and Saturday afternoons for bigger, outdoor puppet-building projects. Laura Astwood, of the Ottawa Stilt Union, will be training a group of new stilt walkers alongside alumni stilt performers in early June. Theatre artist and educator Jane Wells is returning to teach a kids’ drama workshop exploring theatre and ecology. These weekly sessions in June will lead to the creation of scenes and stories for the Pageant performances. New Orleans musicians Kathy Randels and Sean LaRocca are visiting New Glasgow to present a workshop July 2-8 at Gulf Shore School in North Rustico, exploring vocal song writing and music improvisation inspired by the natural environment. This workshop is open to musicians and vocalists of all ages and experience levels, and it aims to gather a group of musical performers to take part in the Pageant performances. Cleveland-based playwright Michael Geither is offering a new take on playwriting with his weeklong workshop, “The Electric Eclectic.” This workshop, for beginner to advanced playwrights, will explore approaches to writing for the stage that will surprise and reward both writer and audience. This workshop runs June 16-23 at The Mill in New Glasgow. The public is encouraged to take part in these workshops and in the creation of this magical community event. Advanced registration is required for all workshops, and you can sign up here. It was the day I had been dreading (and anticipating) since I was told I was going to be a river kid (one of the main roles) in this year's River Clyde Pageant. It was opening night. I had been practicing almost every day for two months to memorize eight scenes and three songs yet it still didn’t feel like long enough. Nervously reciting lines in my head, I got in the car and we headed to New Glasgow where the traveling performance was to take place on the bank of the river. Almost immediately I started rambling, saying things like “I’m going to mess up” and “We are all going to die” in typical nervous Celeste fashion. My brother, playing the part of a troll, kept telling me to shut up which I did, eventually. Before I knew it we were at the church. The church was, as usual, a whirlwind of activity as herons and water spirits applied makeup, foxes pinned on tails and our directors, Megan, Ker and Jane, were trying to organize everyone. A quick line run and choir practice later we set off to the Gardens of Hope to do warm ups and greet the audience. Joe and Eiffie ( the other river kids ) seemed just as nervous as I was as we played theatre games such as Hep Hep Bang. We did a cheer and then it was time to go up the hill to direct the audience. As we were waiting, we discussed the life span of jellyfish and rambled nervously. We directed the huge (around 150 people) crowd down the hill and then the foxes jumped out of the bushes. That was our cue to go. We ran down the hill singing and all eyes were on us. It was now or never. The scenes seemed to blur together, the troutlets, the farmer and the mermaid, the herons and the crow, the trolls, more mermaids and suddenly we were taking our bows. Everyone was celebrating. We made a beeline towards the food knowing it would be gone in no time. All the kids sat on the damp ground behind The Mill and ate. Then we ran around laughing like lunatics, climbed trees and played cards until long after dark. People trickled away until it was just my mom, Ker, Megan, a few other cast members and myself. These people were now like my second family. We bid them goodbye and we headed home knowing that tomorrow we would do it all over again. Celeste performed as a River Kid in the 2017 River Clyde Pageant, and as a Crankie Kid in 2016. If you have a story to share about your Pageant experience, let us know! Canadian and international artists will lead a series of free public workshops in preparation for this year’s River Clyde Pageant, titled Wake the River Clyde, in New Glasgow, Prince Edward Island. Members of the public can learn how to walk on stilts, build puppets, try their hand at playwriting, and participate in a week-long music workshop exploring the New Orleans Jazz Funeral tradition and its connections to PEI musical traditions. It’s all part of the early creation work for the Wake the River Clyde, co-directed by Megan Stewart and Ker Wells. Workshop participants can join the Pageant as performers for the five performances taking place July 29, 30 and August 4, 5 and 6. Last year’s River Clyde Pageant was a collaboration between artists and volunteers from across PEI, who came together to create a travelling spectacle about the river at the heart of New Glasgow, and the environmental issues that affect its sustainability. This summer, Wake the River Clyde will use a similar model of collaboration but will tell a new story, featuring new and returning characters. Stilt walking workshops run June 3-11 in Charlottetown and New Glasgow. These sessions are open to anyone age 12 and up, and are led by Ottawa-based stilt teacher and performer Laura Astwood. All participants receive a pair of stilts to keep. Professional playwright Michael Geither, from Cleveland, Ohio, will teach a creative writing workshop called “Fifty Ways to Start A Play,” from June 11-17. This workshop will include sessions to develop personal creative writing as well as writing for the Pageant. It will focus on writing scenes, monologues and other material for the stage. Sessions take place at The Mill in New Glasgow. An exciting new addition to this year’s Pageant is the River Clyde Jazz Funeral band that will process over the New Glasgow bridge in a solemn and celebratory scene. Local musicians of all ages, instruments and skill levels are invited to take part in a week-long workshop led by New Orleans performing artists Kathy Randels and Maurice Turner, who will explore the intersections of PEI music with jazz funeral music. This workshop runs July 4-9 at Gulf Shore School in North Rustico. The Pageant will also feature puppet workshops, led by Nova Scotian puppet builder Ian McFarlane, and a choir led by New York musician and actor Marianne Rendón. Members of the public are encouraged to get involved in the Pageant and take part in these workshops. To sign up, send us a message via our contact form! Today we reached 75% of our crowdfunding goal! And with twelve days left, we have renewed energy and confidence as we head in to our final weeks of the campaign. To celebrate, we made this video update with Ian McFarlane, who will be leading puppet workshops for the Pageant this summer. Special thanks to Marianne Rendón, who directed, shot & edited this! If you haven't yet made a donation to the 2017 River Clyde Pageant, now is the time! Help us reach our goal of $10,000 - which will cover basic costs of the Pageant: artist fees, workshop costs, materials, and food for the community suppers that conclude each night of the Pageant. And if you've donated already, keep the Pageant on people's minds by sharing updates on social media, and emailing and telling your friends! Let's get all the way up the river! The crowdfunding campaign for the 2017 River Clyde Pageant has reached a major milestone in less than a week of its launch! Megan Stewart and Ker Wells, co-directors of the River Clyde Pageant, are organizing the second event after the remarkable success of the first Pageant, which drew 100 community performers, artists and volunteers and an audience of 500 for three performances. They have set a $10,000 goal to raise money to cover the costs of the event. They were astonished by the widespread support for their crowdfunding campaign on Chuffed.org, which surpassed 30% of its fundraising target in under two days, and 50% in six days. Last year’s River Clyde Pageant featured stilt walking great blue herons, a gigantic trout puppet operated by 7 children, a choir, a Mi’kmaq drum group, mermaids, trolls, and much more. Each performance concluded with a free community supper on the lawn of The Mill Restaurant, prepared by award-winning Chef Emily Wells. Ker and Megan are excited to bring back many of these much-loved characters in 2017, and introduce new elements to the performance. “We have several guest artists coming to lead workshops to create new music and scenes – including a Jazz Funeral band for the river, puppets built from junk and found materials, and a script by community members in collaboration with professional playwright Michael Geither,” explains Megan. To help raise the next portion of money to reach their $10,000 fundraising goal, Ker and Megan are encouraging people to contribute a donation of any size to the online campaign, which ends on March 31st. Local businesses such as Receiver Coffee, Upstreet Craft Brewing, The PEI Preserve Company, and YouMeal have come on board and are offering gift certificates as incentives for donors. All the money raised as part of the campaign goes towards workshop fees, materials, and costs for the post-show community suppers. The fundraising campaign and video from last year’s Pageant can be viewed at: www.chuffed.org/project/river-clyde-pageant. Help us Wake the River Clyde! We’ve officially launched our 2017 Fundraising Campaign to make the River Clyde Pageant happen again in New Glasgow this summer! Hooray! Our Campaign Launch coincides with the release of a short video from last year’s event, which you can see on our campaign page - click the image below to take a look. $10,000 is a lot of money. But, to put it in perspective: approximately 500 people experienced last year’s River Clyde Pageant, as audience members, volunteers, performers, and workshop attendees. If each of those 500 people gave $20, we would hit our goal! So, if you experienced the Pageant in some way last summer, and would like to see this inspiring event happen again, please consider a donation, large or small, to Wake the River Clyde. We need your help in other ways, too! Big campaigns like ours this rely on strong word of mouth to reach their targets. So, if you believe in this project, we invite you to SHARE the campaign on social media, email your friends, and tell people all about it! We will be posting frequent updates on our facebook page - ‘Like’ us and follow along! We’re grateful for the amazing team backing this project already. On the Campaign page, you’ll notice an array of awesome perks you can get in exchange for your donation. We’ve partnered with local businesses and restaurants such as Receiver Coffee; The PEI Preserve Company; YouMeal; and Upstreet Craft Brewing, who are offering gift certificates and meals for special perk levels. Other sweet perks include tickets to the Pageant, Pageant t-shirts, and even a chance to PERFORM as an original character with your friends or family in this summer’s event!!! We are also working on the campaign with a dedicated team of River Pilots: 11 people who were involved in the Pageant in some way last summer, and have generously signed on to help us fundraise. Along the way, we’ll be posting photos and testimonials from some of these folks, who shared their thoughts on what the Pageant means to them. So, we invite you to join us on this month-long fundraising journey, to Wake the River Clyde and make theatre magic happen again again in New Glasgow!